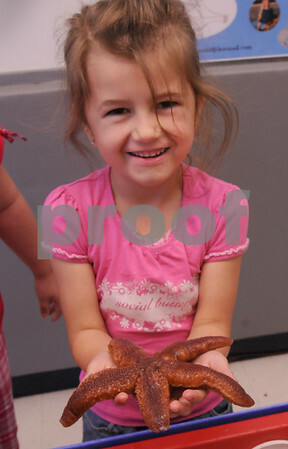 Salisbury: Emily Johnson, 6, laughs as she holds a starfish at Salisbury Elementary School on Thursday. Marine biologist Ellen Goethel was teaching children about ocean life and they took turns checking out some of the live specimens she brought along. Bryan Eaton/Staff Photo Newburyport News Thursday June 4, 2009.